It has been awhile since my last post. Nothing much has happened except maybe an extra 5lbs that I have packed on between the holiday parties, birth control and stress. I am just ready for this all the be over. The holidays and all the meds, procedures and lack of control over my own life. Am I a grinch? Well probably but really want the holidays to be over so we can be that much closer to baby. Thursday is the hysteroscopy so no food after midnight Wednesday and surgery is at 1:15pm. Maybe the no food thing will be good because I am having trouble finding anything that fits. I wonder if it was the 20 cookies I ate the other day. I made soft mint chocolate cookies with Andes Creme de Menthe bits. They were so good but I probably ate half the batch and I am feeling it today as my pants are extra tight. I also made a veggie Christmas Tree that I had seen on pinterst. It came out pretty good and it is always a good idea to bring a healthy dish to any party so you can have something good to snack on. I have been working out like crazy but have definitely been eating much more than I am burning. I will be happy to get back to a schedule again. I have also come to realize me and breads don’t mix and that sugar is very addictive. Two things I need to begin to avoid in this next year. I get too many tummy troubles with bread and once I have a little sugar I can’t stop myself. I am much better when I just avoid. Really thinking I should check with the doc about some sort of gluten or wheat intolerance. We celebrated Christmas with hubby’s fam yesterday and will again with his extended family tonight. Tomorrow we will have our own little Christmas in the morning and go to my sister’s place for brunch and mimosas with my mom. We won’t be doing presents with my family till next Saturday. My brother is a pilot so he rarely has Christmas off. Before we know it 2013 will be here and we will be starting FET #3. Lucky #3. Happy Christmas Eve! Freedom Fertility Pharmacy called me yesterday to let me know my clinic called in my meds! I am just one step closer to starting IVF #2! We are still unsure how much it will be since I switched to Doug’s insurance. She said if we have to pay out of pocket the meds will be $3,500. Ouch. Last time it was about 3K that we ended up spending. Meds are shipping out to me Tuesday and hopefully my clinic calls me today to let me know the game plan. I am praying that insurance covers these meds and we are only paying less than 1K for the meds. Dinner was pretty good and healthy last night. I have not particularly been in the salad mood lately but have been feeling guilty with the fact I bought a bunch of salad stuff and it would go to waste. 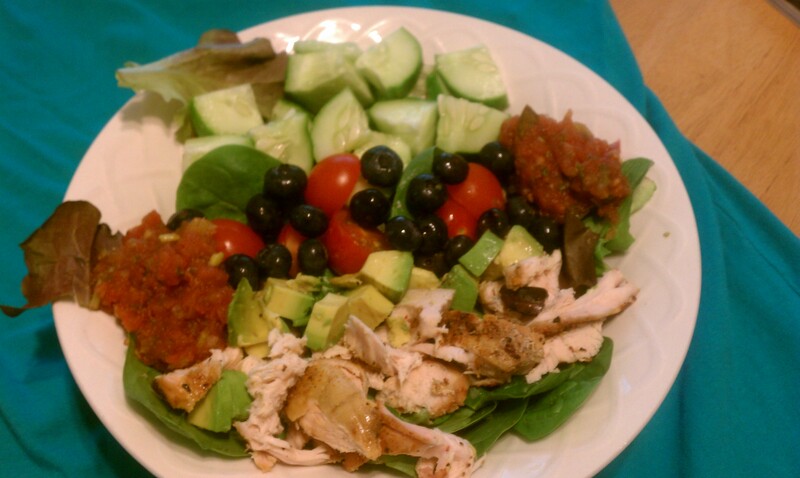 It was pretty tasted and included fresh tomatoes and cucs from our garden, spinach ,romaine, avocado, chicken, salsa and blueberries. I have been digging Newman’s Light Sesame Ginger dressing. Woke up this morning feeling pretty unrested so not sure how much I will be working out today. Did 25 minutes on the elliptical this morning but I think my body is telling me to rest! 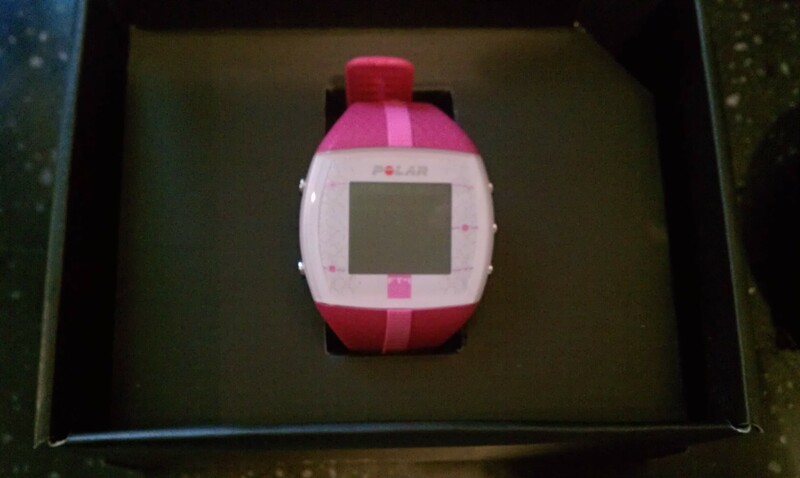 My heart rate monitor came in today!!! I have been wanting one FOREVER but finally decided to splurge and get one. What a pleasant surprise to a tired, boring Monday. I typically make up a large batch of cooked turkey for the week. Doug and I will have turkey tacos at least once a week. 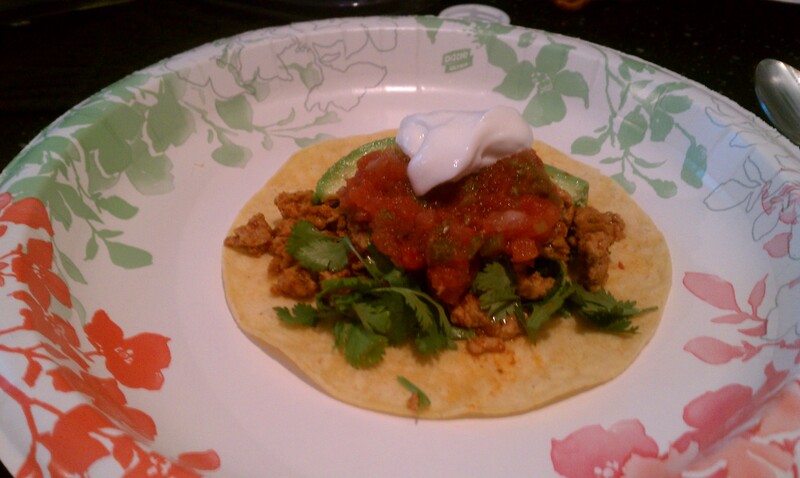 Today I had a turkey taco with corn tortilla, avocado, cilantro, salsa and a dollop of greek yogurt. Mmmm yummy. 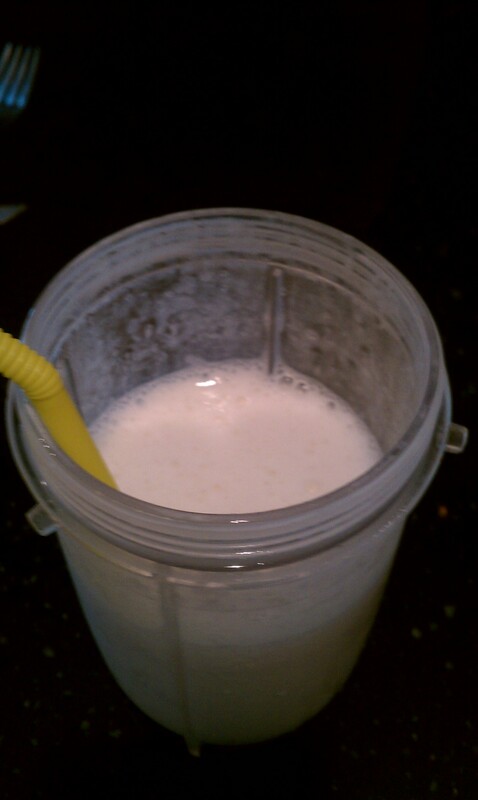 Along side that I had to make this cake batter protein shake I found on Dashing Dish. Not a beautiful pic but it was mighty tasty. Oh and for the record I did start jotting down what I ate today! Yay me. It looks like overall it was a good Monday.